This library contains raster data files (ESRI GRID format) for most attributes (73 in total) of the SGDBE and PTRDB databases of the ESDB version 2 ; cell sizes are 10km x 10km and the grid is aligned with the reference grid recommended during the 1st Workshop on European Reference Grids in the context of the INSPIRE (Infrastructure for Spatial Information in Europe) initiative. (Workshop proceedings). The grids are in the ETRS89 Lambert Azimuthal Equal Area (ETRS_LAEA) co-ordinate system, also documented in the (draft) proceedings. The Grid origin is defined 4.321.000,0 m west of centre point of the projection (52N, 10 E), and 3.210.000,0 m south of projection centre point (52N 10 E). The grid extent is such that it has it covers all EU25 countries. Width : 7.500.000,0 m ; Height : 5.500.00,0 m ; 750 columns, 550 rows. The Grid origin is defined 4.321.000,0 m west of centre point of the projection (52N, 10 E), and 3.210.000,0 m south of projection centre point (52N 10 E). The grid extent is such that it has it covers EU25 and the former USSR. Width : 9.380.000,0 m ; Height : 10.520.00,0 m ; 938 columns, 1052 rows. Raster values have been derived using the "features to raster" tool in the Spatial Analyst extension of ArcGIS, the feature layer being a shapefile created from the SGDBE geometrical database to which attributes from SGDBE and PTRDB have been linked according to the "dominant value" principle. (see here for an introduction). 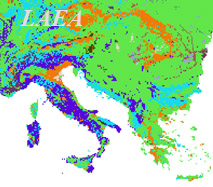 "Marc Van Liedekerke, Panos Panagos, ESDBv2 Raster Archive - a set of rasters derived from the European Soil Database distribution version 2 (published by the European Commission and the European Soil Bureau Network, CD-ROM, EUR 19945 EN)"
All_grids_laea.zip (14 MB) : a zipped version of all rasters in native GRID format ; unzipping this file results in 74 directories (one info directory and 73 grid directories (one for each raster) referring all to the same info directory) and 73 .aux files, which contain projection information needed by ArcGIS. The total size of the library is 96 MB. All_grids_laea_plus.zip (35 MB) : a zipped version of all rasters in native GRID format ; unzipping this file results in 74 directories (one info directory and 73 grid directories (one for each raster) referring all to the same info directory) and 73 .aux files, which contain projection information needed by ArcGIS. The total size of the library is 238 MB. For the convenience of the user, the reference grid used in the rasters above is also available as a polygon or line shapefile ; to be used for visually overlaying the rasters. etrs_laea_grid_polys.zip (zipped 11.5 MB ; unzipped 70 MB); note : the polygon cells are not labelled according to the recommendations of the workshop proceedings.